"Spring Time Training Continues In The Northern Forest!" It was a good week here getting in two days of training, going out for a Moose Burger Supper and having friends over for a "Cabine Les Sucre" brunch. The work with young leaders continued this week with Tepeu, Yoda, Kira getting extra attention. Kira along with Bergen ran lead starting in the kennel running in the Open Team. The trail was very hard and fast both Tuesday and Friday and it was rewarding to see Kira and Bergen stretching out the team on two very quick runs. Kira certainly loves a fast/hard trail. Kira, although being tiny, has a big attitude leaping in the air in anticipation of starting the run. On a hard packed trail, she has great speed and performs with enthusiasm and focus. On Wednesday night, we were invited to my friend Denis's place for a wonderful dinner of Moose Burgers, salad and fries along with a few glasses of wine. and great company. Thursday, we had over our friends Valerie & Laurent for our version of Cabine Les Sucre, a Quebec tradition of the celebration of Spring. The meal consisted of: Bacon, Eggs scrambled in Maple Syrup, Pancakes, Ham in a maple syrup reduction sauce, Home Made Soup Au Pois (that cooked for 17 hours), Baked Beans with Maple Syrup, Creton (a pork pate), Baguette and Mashed Potatoes. Ofcourse, there was extra Maple Syrup on the table if needed and a nice bottle of French Wine. Needless to say, no one were left hungry. 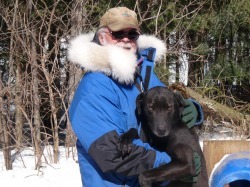 Both occasions were great relaxing visits after a busy season, for all of us, running sled dogs. Well another season is winding down. "May the sun be on your face and the wind at your back"